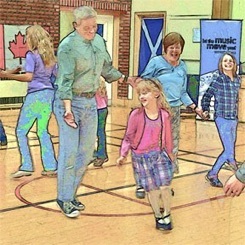 We have occasional Family Ceilidhs — fun events to introduce kids, parents, grandparents, etc. 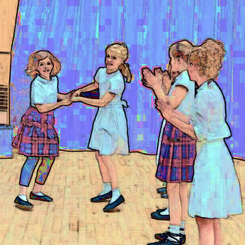 to the joys of Scottish social dance — Typically followed by pizza. 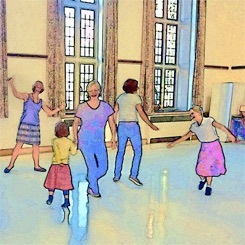 When the next Family Ceilidh is developed, details will be on the Ceilidh page. Saturday mornings at Rosedale Presbyterian Church 9:00-9:45am. The class is for youngsters but parents are encouraged to be part of the fun. 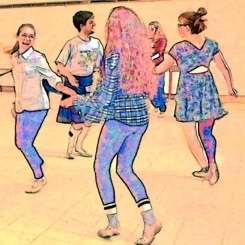 Teens and starving university students can learn and dance free, at The Bishop Strachan School with St Clement’s social group. Details on St Clement’s page. Erin Mills social group in Mississauga welcomes teens for learning and dancing. Details on Erin Mills page. Rosedale accepts new young dancers throughout the year. For more info contact Moira Korus.